Thank goodness it’s not often that a storm of Sandy’s magnitude bears down on the NY region like it did, leaving destruction and chaos in its midst. But when it does it is nice to know that there is a game plan in place and a delicious way to help your neighbors get back on their feet. Jeffrey Pogash notes, “Many of our fellow citizens of the Greater New York Region have suffered devastation to their homes and desperately need food, water and clothing. Jonathan, Contessa Brewer and I, organized this Red Cross benefit prior to the disaster, but have asked the American Red Cross to direct the proceeds from the sale of tickets to Hurricane Sandy relief (www.redcross.org/hurricane_aid). The event, to be held this Sunday, November 18th, from noon-2 PM at the Empire Room in the Empire State Building (350 Fifth Avenue – www.esbnyc.com), offers a fine luncheon, a selection of three Bloody Marys and the knowledge that your $35 ticket price goes directly where it is most needed right now. Won’t you join them for a Bloody Mary? 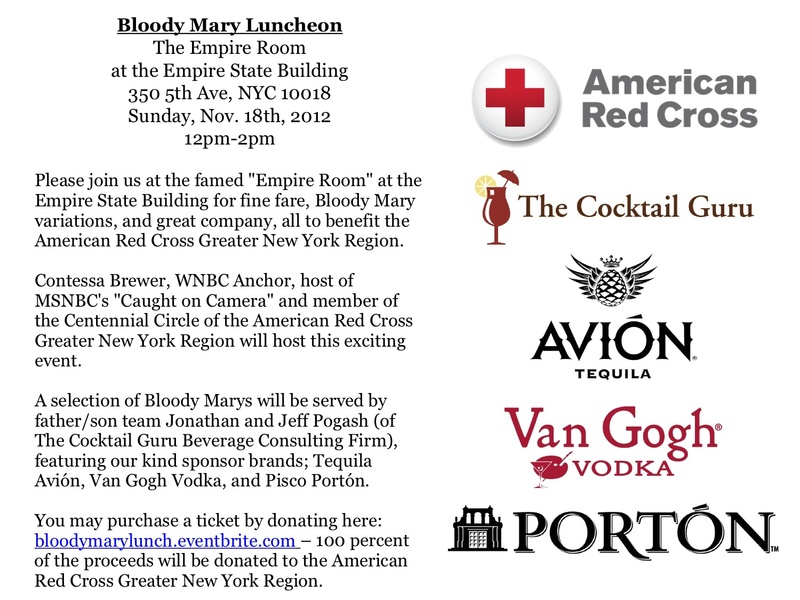 Tickets are available at bloodymarylunch.eventbrite.com. 41 years later, thanks to Hurricane Sandy, New York and New Jersey residents may find themselves in the same sort of dire circumstances for which SOME was founded. To help make sure this doesn’t happen to your neighbors, consider joining these Top Chef chefs for a benefit dinner this evening. Sosa and his Top Chef alums Dale Talde (@DaleTalde and www.taldebrooklyn.com), Kevin Sbraga (@KSbraga and www.sbraga.com) and Jennifer Carroll (@ChefJenCarroll) are joining forces this Monday night at Sosa’s restaurant Añejo Tequileria in Hell’s Kitchen to raise money for Hurricane Sandy victims. Tickets are $100 and all proceeds go straight to the Red Cross. Each chef will create a unique dish in true Top Chef style in a four-course tasting menu with cocktail accompaniment. Additional specialty cocktails will also be available for sale at the event to raise funds for relief efforts. Spirits will be donated by Herradura Tequila (www.herradura.com), Riazul (www.riazul.com), and local producer, Jack from Brooklyn (www.jackfrombrooklyn.com). There will be two available seating times at 6pm and 8pm. Alternately, you can just drop in throughout the night and belly up to the bar for a cocktail. 100% of the proceeds from each cocktail will also go to the American Red Cross. Reservations can be made by calling Añejo at 212-920-4770, visiting the website’s reservation page at www.anejonyc.com, or emailing rsvp@anejonyc.com. 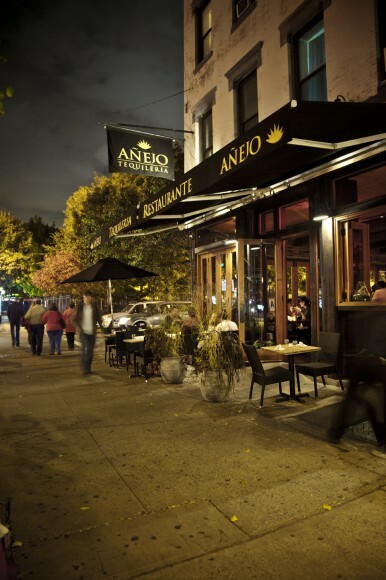 Añejo is located at 668 10th Ave. (at 47th St.) in NYC.